China shipping giant China Ocean Shipping (Group) Company (COSCO) is in talks to own part of a major Greek port giving it increased access to European markets. Company officials said COSCO Hellas, the firm's subsidiary in Greece, is interested in taking part in possible plans to buy shares in the Piraeus Port Authority (PPA). So said an official surnamed Chen at COSCO's port operations department. PPA handles almost 60 per cent of all Greek shipping. Chen said COSCO President Wei Jiafu discussed port investment when he met Greek Prime Minister Kostas Karamanlis in January, who was on an official visit to China. Chen would not give further details as talks are in the initial stages. 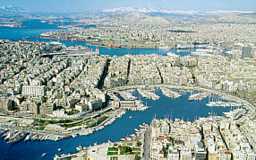 The chance to buy into ports was created with the privatization of significant ports in Greece, including Piraeus. The Greek Government owns 74.1 per cent of PPA at the moment. The Thessalonica Port Authority said COSCO Hellas has also expressed an interest in developing co-operative ties with the northern Greek port. Another firm, China Shipping Group (CSG) China's second-largest shipping company is seeking facilities in the Greek port of Crete. COSCO President Wei Jiafu said earlier that port investment is a priority for the company's future expansion. In December the group was involved in a joint venture formed by AP Moeller-Maersk and Hutchison Whampoa to buy and develop the second phase of Shanghai's Yangshan port. COSCO Pacific, a port investor affiliated to the Group, took 10 per cent of the venture. In December, the group also signed an agreement to buy a 20 per cent stake in the Suez Canal Container Terminal in Egypt, its first port investment in the Middle East. COSCO now holds stakes in a number of Chinese ports in the Pearl River Delta, the Yangtze River Delta and the Bohai Rim in northern China. Outside of China, it has a 49 per cent stake in a terminal in Singapore, a 25 per cent stake in Belgium's Antwerp port and stakes in other ports in the United States. COSCO is expected to register a pre-tax profit of around 20 billion yuan (US$2.5 billion) in 2005, breaking all past records, said Chen.